How can people eat raw food, ALL of the time? What about when it’s super cold and rainy outside and the body craves warm toasty food? Apparently none of this enters into the head of a raw food enthusiast, as to a ‘Raw Foodie’ heat or cooking equals death, or dead food, and is certainly not worthy of putting into the body. The Raw Food movement, has been gathering momentum over the past few years, and is particularly popular amongst vegetarians and vegans. Proponents of the Raw Food diet believe that heating food above 44 degrees kills off many of the enzymes that are needed for proper digestion and absorption of the nutrients. They also believe that heating the food decreases the nutritional value of the food, and can become harmful to the body. Live, real or raw food, still contains within it, all of its nutrients and life energy, which when eaten is passed on to the person eating it. Based on this belief that there is more nutritional value, and live enzymes in the food, diseases can be avoided, overall inflammation in the body is reduced and longevity can be created. They tend to eat loads of fruit, vegetables, nuts, seeds, sprouts, fermented foods, seaweeds, algae, wheatgrass, low temperature dehydrated crackers, pressed oils, coconut oil and raw cacao. Whilst we do eat a fair amount of raw food (in the form of salads and raw veggies and nuts etc), I was interested to have a whole meal. This lead us to the café Earth to Table in Bondi for a Sunday breakfast date. 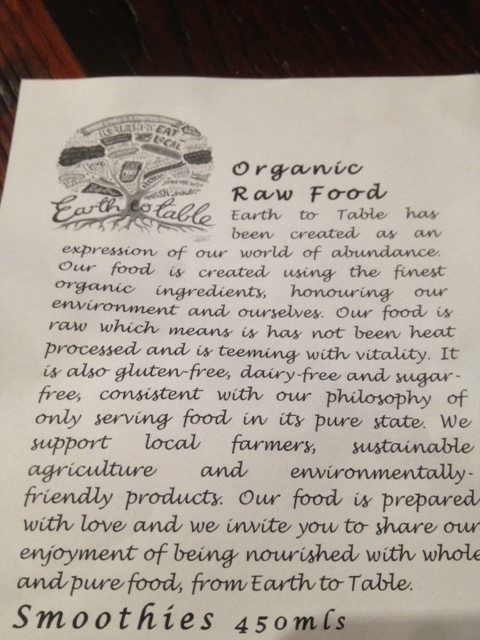 Earth to Table is owned by Julie Mitsios, one of Australia’s best known, and leading authorities’ on Raw Food. It is a cute café, and oozes zen (must be all the good food energy floating around…). 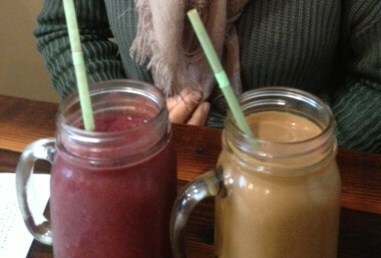 We both ordered these amazing smoothies, and followed it up with ‘toast and jam’, and ‘porridge’. 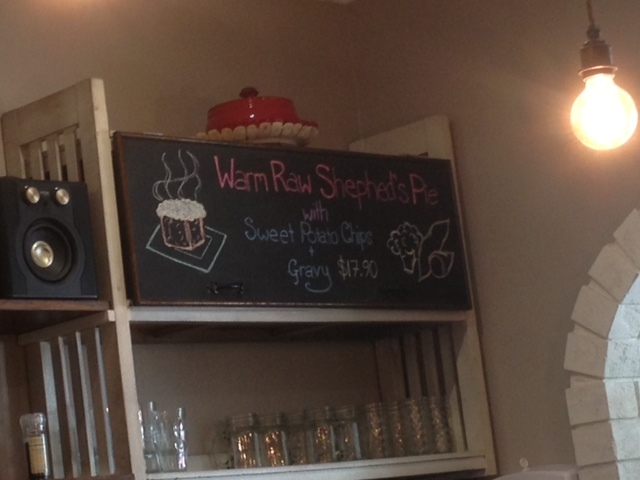 Interestingly on the menu they had a ‘Warm Sheppard’s pie?’, I’m not sure how they would serve that one. My toast and jam was delicious – the Cinnamon and raison ‘toast’ was made from dehydrated seeds/sprouts and was accompanied with a blueberry lavender chia jam. MC had the Apple cinnamon & cranberry porridge. 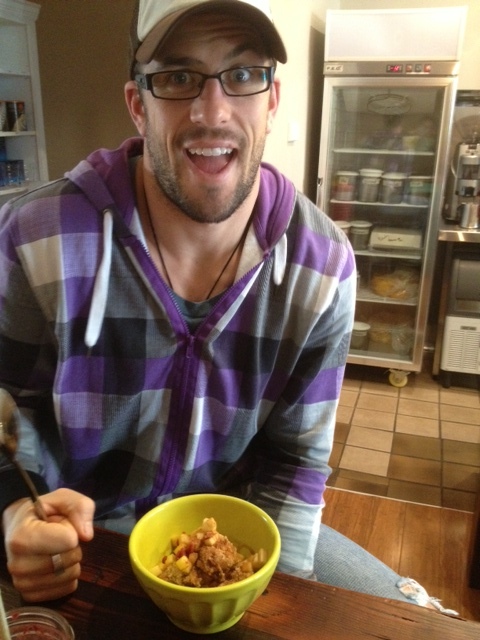 Admittedly I did feel quite hip and cool eating my raw food, but I think it’s something I could only do on occasion. I was left feeling hungry and hankering for a hot coffee (for the record they do a cold press style of coffee here which is really yummy, but I needed something hot). I will certainly venture back there again, especially since there is a whole cabinet of raw deserts with a particular ‘raw caramel slice’ that has my name all over it. Now, what did MC think? 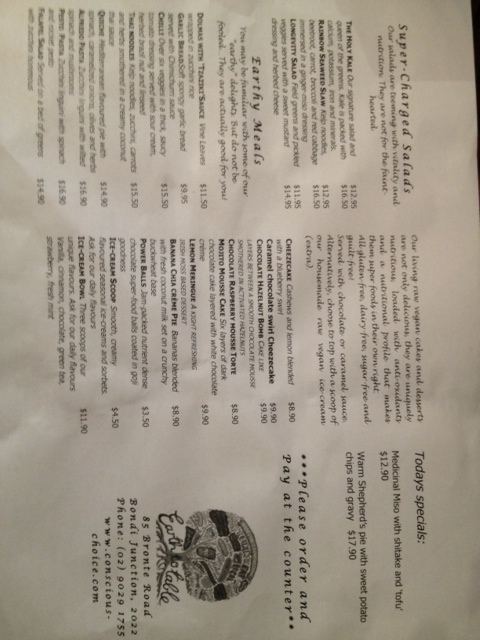 Yeah, ‘raw food’ and ‘Meat Mike Campbell’… how’s that going to go..? I won’t hold you in suspense- it was unfulfilling, confusing and lacking. I won’t say it was lacking meat, because of course I don’t eat meat with every meal (just most), but it was lacking substance. The ‘porridge’ I got wasn’t actually porridge, for this would require oats to be cooked- not raw. So I was confused. NN thought it was probably a mix of chia bran and almond meal, which with the other ingredients might sound be lovely, but it was just a bit puffy and absent. I wasn’t satisfied at all and left feeling like the ‘life energy’ was brawling it’s way around my stomach. Plus that ‘porridge’ cost $12. Now I’m more than happy to pay for food, but for this, I felt a little insulted. But I am biased, and that’s obvious- so gentle apologies to any ‘raw foodies’ out there. Anyway, enough bashing of the specific meal I had. Earth to Table did have a nice feel to it, and they had a tonne of wonderful products on offer on the shelves, such as probiotic juices, nuts, oils, etc etc. The kind of things that many people could do with adding to their daily diet- this I take my hat off to. As for the concept of ‘Raw Foodism’, well it’s important to note that everyone should partake in this to come degree- salads, fruits, nuts, even sashimi (surely this classifies?) and we most definitely do have a lot of raw food. However, we balance this with quality cooked food packed full of nutrients- some of which require cooking to unlock said nutrients. Due to a lack of meat and animal products there are some precautions of this diet, which may include certain nutritional deficiencies such as calcium, vitamin D, vitamin B12, iron, zinc, and overall calories. Also, raw foods are associated with greater incidence of food borne illnesses, such as food poisoning and gastroenteritis. This diet may not be appropriate for children, pregnant or nursing women, people with anemia, or people at risk for osteoporosis. As long as you ensure that more than 50% of your diet is raw than you will be receiving the benefits from this raw style, but also able to cover some of the above potential issues. That way you can still have steak. And eggs. And bacon. And, you get the point- yummy stuff. Raw Food- I’ll take it in portions, but not in entirety. I’m so disappointed you guys were hungry/left a bit unsatisfied. Unstandably raw food is lighter so doesnt give you the heavy/full feeling we are used to so when I have friends trying raw for the first time I always recommend the lunch options like the chilli which is more filling than the breakfast options. I had the sheppards pie on Saturday it was divine!!! The “meat” portion is the same as the chilli it has a spiciness which makes it feel heated, the cauliflower mash was creamy & mixed perfectly with the onion & gravy on top & it comes with sweet potato chips! If you fancy a warming drink while your there (lets be honest we all do in the winter) try the hot give me a quick fix or herbal teas. P.s. the deserts are to die for!!! That was me, NN left pretty satisfied. Just hungry not long after… And she really liked hers. I just felt like I was eating the fluff from behind the couch. 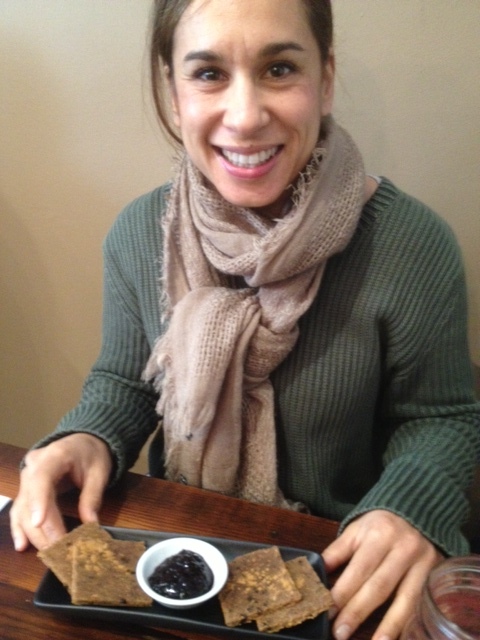 And yes, the brownie looked the goods!